Back Thread : 37mm. All lens with 37mm front thread. Lens hoods are primarily designed to prevent unwanted stray light from entering the lens by extending and shading the end of the lens. Front Thread : 46mm. Compatible with: Canon EF-S 10-18mm F4.5-5.6 IS STM Lens. 1x EW-73C lens hood. Images are only representative. Samyang Lens Hood 49mm Front Lens Cap for AF 35mm F2.8 FE Sony E. Samyang 49mm Front Lens Cap x 1. 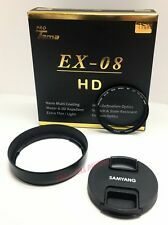 Samyang Lens Hood for AF 35mm F2.8 FE x 1. JJC LH-XF1855 Lens hood is designed for FUJINON LENS XF14mm F2.8 R and FUJINON LENS XF18-55mm F2.8-4 R LM OIS. Lens hoods are primarily designed to prevent unwanted stray light from entering the lens by extending and shading the end of the lens. 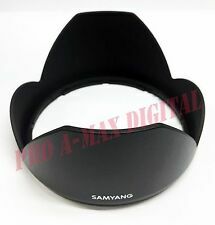 Samyang Front Cap Lens Hood for AF 35mm F2.8 FE Wide Angle Lens. Used for Russian Soviet lenses: Helios 44, Helios 44-2, Helios 44-3, etc. Made in USSR. The item will arrive in 1-3 weeks to your place (it depends upon your country). I always try to describe item as good as possible, to check everything. 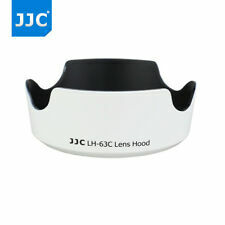 JJC LH-JXF35C Bayonet Lens Hood is designed to prevent unwanted stray light from entering the lens by extending and shading the end of the lens. The non-glare matte finish on the inside further prevents or limits lens flare. 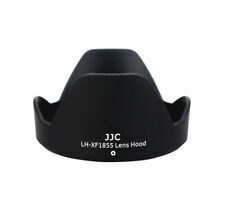 JJC LH-JXF35S Bayonet Lens Hood is designed to prevent unwanted stray light from entering the lens by extending and shading the end of the lens. The non-glare matte finish on the inside further prevents or limits lens flare. Samyang 35mm T1.5 VDSLR AS UMC II Wide Angle Lens for all mounts. 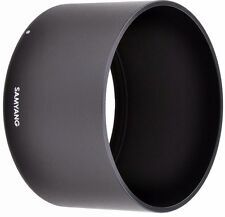 The Samyang Lens Hood is designed for the following Samyang Lens Samyang Lens Hood for 35mm F1.4 / T1.5 Wide Angle Lens. Samyang 35mm F1.4 AS UMC Wide Angle Lens for all mounts. JJC LH-JXF35SII Bayonet Lens Hood is designed to prevent unwanted stray light from entering the lens by extending and shading the end of the lens. The non-glare matte finish on the inside further prevents or limits lens flare. The Samyang Lens Hood is designed for the following Samyang Lens. Hood has a bad case of exterior paint loss but inside is fine. "Very Rare" Melcon 40.5mm Metal Hood, w/Case For Nikkor H C 5cm F2 LTM39 Lens. Including: Case. This item is sold out everywhere in Japan and very hard to get it ! The Samyang Lens Hood is designed for the following Samyang Lens Samyang Lens Hood for 12mm F2.8 / T3.1 Fisheye Lens. Samyang 12mm T3.1 ED AS NCS Fisheye Cine Lens for all mounts. Samyang 12mm F2.8 ED AS NCS Fisheye Lens for all mounts. This sale is for a mint condition genuine Mamiya RB67 / RZ67 lens hood for the RB67 or RZ67 50mm and 65mm wide angle lenses. I also often use one with a Mamiya 645 35mm lens. This hood has no signs of use; I think it has never been used and it is far cleaner than most with minimal surface oxidation. "Rare" Nicca 40.5mm Metal Hood, w/Case "MINT" For Nikkor H C 5cm F2 LTM39 Lens. This item is sold out everywhere in Japan and very hard to get it ! Including: Case.Box. JJC LH-JXF16 Lens Hood is designed to prevent unwanted stray light from entering the lens by extending and shading the end of the lens. The non-glare matte finish on the inside further prevents or limits lens flare. 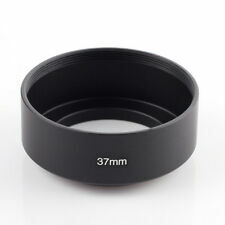 The Samyang Lens Hood is designed for the following Samyang Lens Samyang Lens Hood for AF 35mm F1.4 FE Wide Angle Lens. Samyang AF 35mm F1.4 FE Wide Angle Auto Focus Lens for Sony E.
Leitz Canada Leica Lens Shade Hood 12543 for M 21mm f/2.8 M6 M3 etc From JAPAN #1074. MINT Condition! This item is very clean and beautiful. 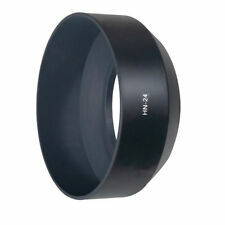 Mamiya Rubber Lens Hood - For 50mm / 65mm (RB67) and 45mm (M645) Lenses - Nice! PUSH ON LENS HOOD (NOT THREADED) DESIGNED FOR THE MAMIYA 50mm / 65mm LENSES (MAMIYA RB67) AND ALSO THE 45mm LENS (MAMIYA M645). MAMIYA RUBBER LENS HOOD. This is a used Canon lens hood W-62. It is clean and in good condition. This hood was made in Germany. Lens Hood & Filter Mount - Excellent. Single Clear Lens Filter, as fitted. 1 x Lens Filters - Good. Lens Holder, as pictured. The Samyang 12mm Lens Hood is designed for the following Samyang Lens Samyang Lens Hood for 12mm F2.0 & T2.2 Cine Lenes. Samyang 12mm T2.2 Cine NCS CS Extra Wide Angle Lens for all mounts. Samyang 12mm F2.0 NCS CS Extra Wide Angle Lens for all mounts. This item is very clean and beautiful appearance. Condition is a personal opinion. ■ Functional. This hood is in used but reasonable condition and shows signs of use. This hood was made in Germany. Made of premium aluminum alloy, the lens hood can prevent unwanted stray light from entering the lens by extending and shading the end of the lens. The non-glare matte finish on the inside further prevents or limits lens flare. EF 40mm f/2.8 STM lens. EF-S 24mm f/2.8 STM lens. Lens hoods are primarily designed to avoid unwanted stray light from entering the lens by extending and shading the end of the lens. Type: ES-52 Lens Hood. 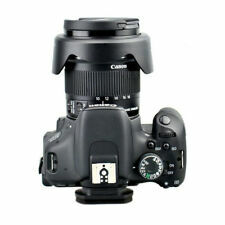 Features: Lens Hood Canon EF-S 10-18mm f/4.5-5.6 IS STM Lens replaces EW-73C Brand new! Quality Guaranteed !! Speedy Shipment!!! A lens hood shades the lens from stray light, improving your contrast and image quality. It can assist in keeping moisture or wind-blown debris off the lens; and it protects the front barrel from the inevitable impacts against walls, door frames, and other real-life obstacles Smooth surface, & matte inside.. Compatible with: Canon EF-S 10-18mm f/4.5-5.6 IS STM Lens Color: Black . In addition, the "petal" shape of this lens hood maximizes the amount of hood coverage for the minimum amount of weight and hood area. There is no vignetting with the hood on. The hood allows you to put on filters and a lens cap. ID is 56.2mm. Model 55mm. MPN Does not apply. UPC Does not apply. Custom Bundle No. Nikon HK-14 Slip-On Lens Hood. Compatible Model List : AI-S 20mm f/2.8 (Manual Focus). ♢ Focusing Screens. ▷ Fuel / Oil Hose. Type : Lens Hood. ♢ Lens Cap. ◈ Quick Connect Fittings. ♢ Stainless Steel Braided CPE.